When it comes to choosing a mattress, before one even gets into the multitudes of particular choices, there is a distinction to be made: foam or spring. All mattresses fit broadly into these two categories, and there are pros and cons to each. Here is Sleepopolis’ comprehensive guide to foam vs spring mattresses. A spring mattress is often seen as a more “traditional” mattress, or the predecessor of the foam mattress. They consist of lots of metal coils suspended in the other materials of the mattress. They can offer a lot of support, particularly for heavier people or those with back ailments. However, a good quality spring mattress can be comfortable for anybody. Innerspring mattresses are more traditional and some see them as old fashioned – however, they are still very popular. They offer a lot of bounce, good temperature control, and come in a wide variety of prices. Spring mattresses support the body by pushing back with a similar amount of pressure that the body applies. One potential drawback with this construction can be that the body does not apply to same amount of pressure evenly across the mattress. Thus, the areas of the body which press down the hardest of the bed (typically the chest, hips and head) will get the most pushback. For some sleepers, this can cause nighttime discomfort. In 1857, the first steel coil was invented for use in car seats, in 1865 the innerspring coil was patented, and in 1871, Heinrich Westphal invented the first innerspring mattress. Before this, mattresses were typically like large pillows, stuffed with cotton, down, or wool. In 1899, James Marshall invented the first individually wrapped spring coils, now commonly known as Marshall Coils. By the 1930s, the vast majority of mattresses sold were innerspring. The spring mattress dominated the market until the 1950s, when foam alternatives became available, and still remains a popular choice today. What sets apart a spring mattress from its foam counterpart is the layer of coils of varying density at the center. These provide the majority of structure to the mattress, alongside the support and bounce. There are several factors which can impact on the feel of a spring mattress – the type of spring, the gauge (thickness) of the metal which makes the spring, the amount of springs, and how they connect with each other. The coils are encased in a foam layer with varying types of upholstery to add comfort. The mattress core of springs is the “support layer” while the upholstery is the “comfort layer.” The upholstery layer is made of three sections: the insulator, the middle upholstery, and the quilt. 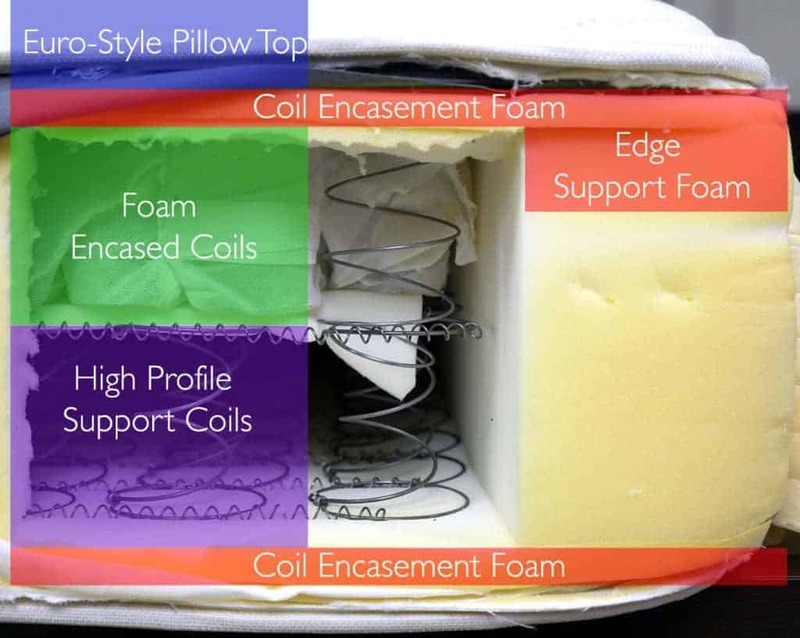 The insulator keeps the mattress core in place, and is usually made of fiber or mesh. The middle upholstery covers the insulator, and can be made of various types of foam or fiber pads. The quilt is the outermost layer of the mattress. Made of light foam or fibers stitches to the inside of the fabric cover (or ticking), it determines the superficial feel of the mattress. The four main types of springs are the Bonnell coil, the offset coil, the pocketed coil, and the continuous coil. Bonnell coils are hourglass shape and laced together to give uniformity of reaction. Offset coils are similar, but have one straight side so they can lace more closely together. Pocketed coils are individually encased in fabric, so act independently of each other. This can give the mattress and more “hugging” feel to the body. The continuous coil uses one piece of metal across all the springs. It can result in more motion transfer for bed sharers. Foam mattresses rely on air trapped within aerated substances (rather than springs) to offer support and bounce. Foam mattresses generally consist of three broad types: polyurethane foam, memory foam, and foam latex. Polyurethane foam is commonly the uppermost layer in an innerspring mattress. A single layer of polyurethane can be constructed into part of a polyurethane foam mattress. It’s chemically similar to memory foam, but without the added viscosity boosters — meaning it’s much more bouncy and springy feeling than memory foam. It’s also lightweight, making it one of the easiest mattresses to maneuver. Poly foam has been a part of mattress construction since the 1950s, although it typically was just a layer within the construction of a larger mattress. It remains a popular foam “layer” choice today. Companies are now moving towards using it as a primary component of a mattress. It is soft, springy and has a quick response to pressure. There are three main types of poly foam: regular grade, high density, and high resiliency. Regular and high density are only suitable for layers, so high resiliency is required for a fully poly foam mattress. High resiliency poly foam is more firm and supportive, but also much more expensive to make.Typically a poly foam mattress will use a combination of all three in order to get the best support and comfort for the price. Memory foam mattresses are made of multiple layers of different densities of foam. The foam is made of polyurethane, and was developed to improve the safety of aircraft cushions. It was then adopted by hospitals, for use in wheelchairs or beds of immobile patients, and eventually made its way to the mass market. Memory foam molds around the contours of the body and has a slow bounce back (meaning it retains the body’s shape for a few seconds after being indented). It can be great for those suffering from back or joint pain, as it relieves pressure on these areas of the body. It is described as working like billions of tiny springs, rather than the finite number in a spring mattress. Foam latex is created by aerating a sap-like substance in order to create air bubbles. The result is a firm but bouncy support, which is uniform throughout the bed. Unlike memory foam, latex “pushes back,” meaning it offers superior firmness and pressure relief. Foam latex also has an environmental benefit over memory foam, as the raw materials are natural and the production process can be extremely clean. Latex mattresses can be natural or man made, depending on the raw materials. Natural latex comes from the from a milky substance produced by the hevea-brasilienis rubber tree, whereas synthetic latex is an artificial replica. There are two different ways of manufacturing latex, called Dunlop and Talalay. Both start with the addition of water and natural vulcanizing agents. Dunlop latex is then poured into the mold in one complete pour, and left to set (which can mean it’s denser at the bottom than the top). Talalay latex is poured into the mold but only partially fills it. The mold is then vacuumed of air, so the foa expands to fill it. Talalay latex is then frozen to preserve its shape and uniformity. Talalay latex is usually more expensive and is seen as a more modern way to produce foam mattresses. Hybrid mattresses combine the use of coils with a layer of either memory foam or foam latex. They were initially conceived for those who were unsatisfied by both pure spring and pure foam options – claiming to offer the best of both worlds. These mattresses allow the customer to feel “on top of” the mattress, while still giving them the support and pressure relief of foam. If you’re struggling with your decision between the two, a hybrid mattress is something not to be overlooked. In a hybrid mattress, the spring type is typically a pocketed coil, which offers the most hugging and contour a spring mattress can offer. The spring type is topped by a fairly thick layer of foam – be it memory foam or foam latex. The foam layer minimises the bounce back and noise making of the springs, while the springs allow the customer to feel supported, on top of the mattress, and still able to move around – which is ideal for those who dislike the sinking feeling of some foam mattresses. There is a huge amount of variance between a foam or spring mattress, and choosing between them can be tricky. There are benefits and drawbacks to either choice, depending on what matters most to the consumer. Here are the different categories where the differences between the two become apparent. Cost: If you’re on a rally tight budget, both spring and foam mattresses are available for almost any budget, though certain construction types will add cost premiums. Durability: Foam mattresses are generally considered to be more durable and long lasting, and this is typically shown in their longer warranties. While spring mattresses can be long lasting, too, there is sometimes a decrease in comfort after extended use, as the springs become less uniform and more prone to poking and sagging. Support: Those with severe back pain are generally pointed in the direction of a memory foam mattress. Memory foam supports the natural curvature of the spine, and keeps the spine in alignment. Bounce: Innerspring beds still offer the bounciest feel. Foam mattress are more shock absorbing, meaning they return comfortable to their natural position, rather than springing back quickly. 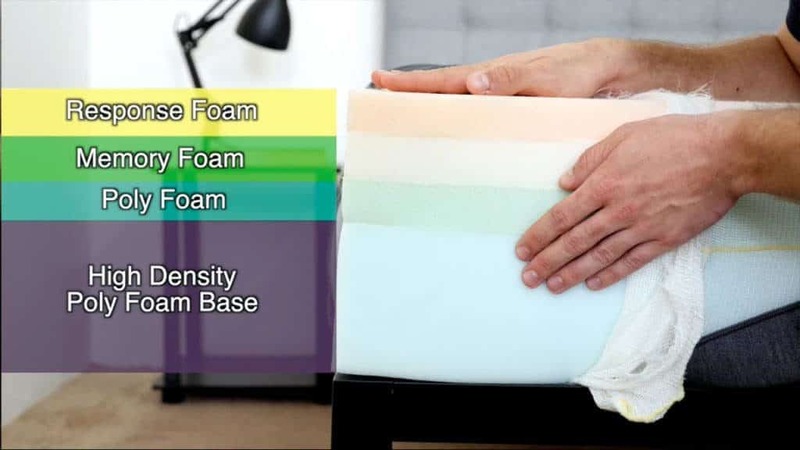 There is significant variability between the bounciness of different foam mattresses, and foam latex is much bouncier and more immediately responsive than memory foam. Movement Absorbency: If you share a bed with a restless sleeper, a spring mattress may become an issue. When they move, the springs will likely bounce back, causing you to move, too. A foam mattress is generally better able to absorb the movement. Temperature: One of the biggest complaints against foam mattresses is their issues surrounding temperature control. Memory foam in particular is particularly prone to trapping heat, because it relies on the heat of the body to become more malleable. It then retains this heat, which can be very uncomfortable for those with body temperature issues or those living in a hot climate. Spring mattresses are still generally a cooler option than foam, however, there are many foam and hybrid options with features specifically included to cool the sleeper. Quality And Price Range: Because spring mattresses have been around for so long, there is often a wider variety of them on the market. They can offer a wide range of feels, firmness levels and support, all across a wider price range than newer foam models. Scent: Foam mattresses have been reported as initially emitting an unpleasant, chemical smell. While it does usually fade after unboxing, it can make the initial experience of sleeping on one a bit noticeable. Sleeping Position: Stomach sleepers should favor something firmer, like a foam latex mattress. Side sleepers generally prefer something softer in order to indent for and cushion the shoulders and hips, so memory foam may work better. Back sleepers tend to like a firm-and-soft hybrid, so a traditional spring mattress could be a good option for them. Again, models and feels vary significantly, which is why we suggest checking out our individual mattress reviews to help find the best choice for you. Personal Preference: Ultimately, a lot of the decision when it comes to choosing your best mattress comes down to what you like. Spring mattresses may lack uniformity, but the enveloping feeling of foam can equally be a turn-off. Once you’ve done your research, it’s important to take into account individual preferences as opposed to broad-strokes assumptions based on the type of mattress. Mattress toppers are typically used to tweak the feel of a mattress, and can be used to salvage mattresses which are no longer comfortable. They are usually made of foam and can be placed atop either a foam or spring mattress which has lost its support or softness. A thinner one can add superficial comfort, but a thicker, 3 inch + topper can really feel like a whole new mattress. For a spring mattress, our roundup page is available here. If it’s latex you’re looking for, see our comparison list here. If you’re most interested in a hybrid mattress, see our review list here. In terms of memory foam, our guide is available here. Finally, if it’s a topper you want, we have a full list right here. Terrific review, I have been literally captivated, thank you so much for details, but heather is right: http://beddings.review has great contents such as video reviews on spring mattress … but your style is definitely better! No comparison, thanks for sharing, again great job! Just looking for a comfortable place to sleep…, so I can stop this never-ending search for the perfect bed to purchase.